Exhausted from the previous days adventure we opted to hang around the cabin today. We drove down to the Howling Hound Cafe (www.facebook.com/pages/Howlin-Hounds-Cafe/248852179382) in our snow-covered Subaru for some delicious, farm-fresh organic eggs, bacon and huge-chunked-fried potatoes for breakfast. You’ll not only find some great grub at this family run restaurant but you’ll also feel like you’re one of the family. The effusive, amicable conversation makes this one of our favorite spots so far. As I’m sure you’ve realized this day held little adventure and a lot of food. A rib-sticking lunch at the historic Old Saloon and Livery Stable held us over till the next day. Since we didn’t go looking for adventure, it kind of came to us. Twice our water at the cabin was reduced to a drip. Local plumber Don Hinks interrupted his Memorial Day weekend to get it going again. Thanks Don. 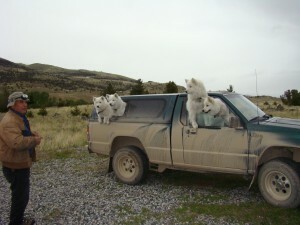 Don and his four spoiled-rotten- snow-white Samoyed sled dogs that accompanied him everywhere were a great interruption to our lazy day and good medicine for our bruised and grieving hearts.